Ця казка з такою холодною назвою уже майже 200 років зігріває мільйони дитячих сердець у всьому світі. Її автор — геніальний данський казкар Ганс Християн Андерсен (1805—1875). «Снігова Королева» — своєрідна візитна карточка «А-БА-БА-ГА-ЛА-МА-ГИ» у міжнародному книжковому світі. This wintry tale has warmed the hearts of children around the world for almost 200 years. It was written by master storyteller Hans Christian Andersen (1805—1875). The tale describes the amazing adventures of Gerda, who goes off in search of her friend Kay after the Snow Queen takes him away. The illustrations to the book were created by Vladyslav Yerko, a well-known Ukrainian illustrator and recipient of many awards at prestigious art and book fairs. He also received the title “Man of Books” when he was named best artist for 2002 by the Moscow “Book Review”. His illustrations became widely known through his work on the books of Paulo Coelho and his work on Andersen's “The Snow Queen”, which won the Grand Prix award in the “Book of the Year” Contest for 2000. 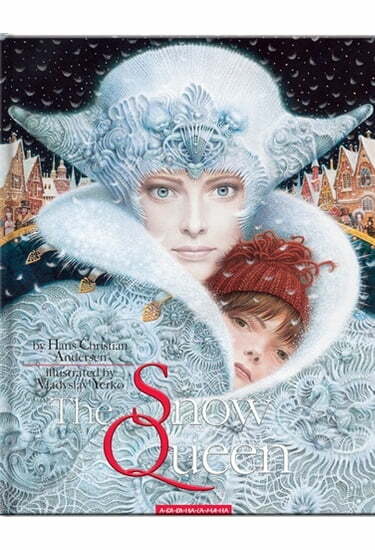 A well-known writer Paulo Coelho once said of Yerko's “The Snow Queen”: “This is the most wonderful children's book I've seen in my life”.